John, thanks so much for the very nice complements, they are appreciated. 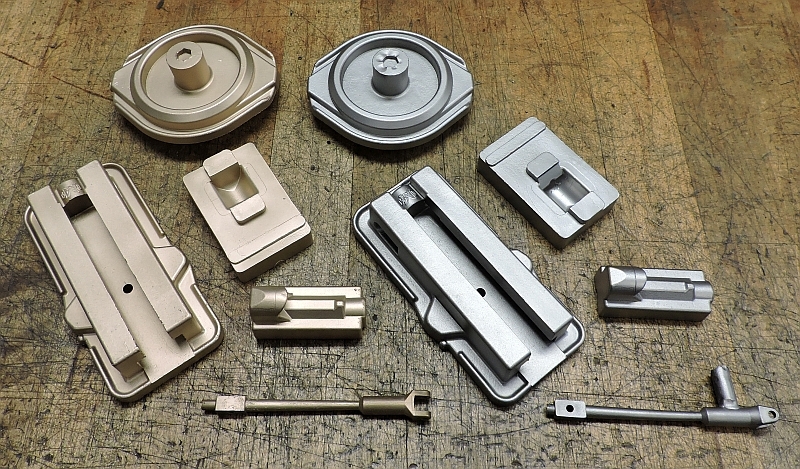 How about we start the week off with a couple nice sets of castings. The foundry sure does a nice job on them. Wow, nice and smooth surfaces, looking forward to seeing them come together! What are the two materials Dave? CI and bronze? what a great project and set of castings, nice work! I've been modeling a D20 which I thought would be a good vise for a small mill and had no idea this resource existed. Any info on availability and price of the castings? Bill the steel castings are 4140 (very tough and strong) and the other set is Bronze. Due to the very high cost I'm not sure the bronze castings are going to be available, but Roland would have to answer that for sure. Mcgyver; Roland will also have to answer your questions on price and availability, I think the castings have a long lead time but I'm not sure how much. Ideally, one would need a surface grinder for the steel castings I would think. Certainly very nice looking castings!! Those are really nice looking castings. Looking forward to the machining part! Jo: pretty castings..would make a nice addition...& Very useful as well. Yes for the best accuracy and finish, you are correct. Fortunately I have access to a nice one in the shop where I work. The flat surfaces could also be carefully lapped, that is my plan for the bronze vise. Nice Castings! 4150 is a challenge, but doable. Are they stress relieved? I'm not sure if the foundry stress relieves these castings or not, I'm thinking they might as they do mostly gun parts for vintage single shot rifles. This is the same material that the Model Builders Vise castings are made from and I had no trouble machining them. It actually machines very nice, not like 12L14 though. I had some big mobile truck components made from 4150 once, and the shop that got the bid from the purchasing agent, had no idea what they had, so they blanked all the parts with a torch! They used up every piece of their carbide trying to cut it until they finally spoke to me! .... can you say glass hard? I then introduced a new heat treating term to them.....Anneal. 4140 and 4150 are very similar, 4150 has a just a bit more carbon in it.. Both are considered low alloys. 4150 is a bit harder to machine. It will harden to a bit harder condition.